It’s the last post for the $100 Room Challenge! Sadly, we didn’t quite finish the makeover yet. 🙁 We searched the house for an hour and couldn’t find the hanging kit to hang the mirror. 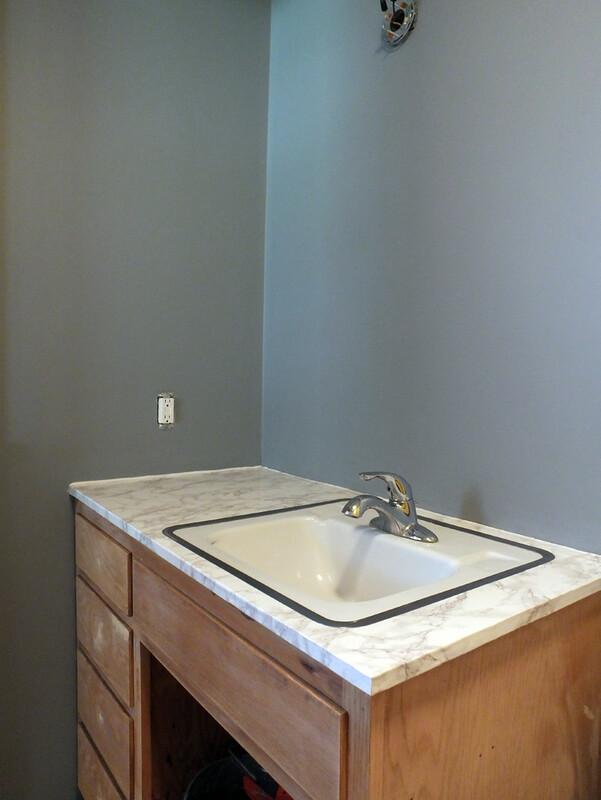 I was also hoping to put up two small shelves next to the mirror to balance out the off-center mirror and sink. We were actually going out of town, so we only had just under 3 weeks to do it all in, BUT I’m pretty happy that all that didn’t get done was hanging the mirror and shelves. We also had the setback when we discovered the rotted subfloor, so that took time, and cost about $10 for the new plywood, but I’m not counting that towards the decorating. We were happy to find the slate-look tiles because slate is something that was often in mid century moderns. Staying close to the originally intended style is very important to us. If you’ve never used the peel-and-stick floor tiles, let me tell you…they’re super easy and super inexpensive. And we’re always way happier with them than we expect to be. As much as we don’t like synthetic materials, sometimes, it’s just the best option. We also didn’t get the cabinet pulls we were planning on. We wanted tab-style that is much less visible, but IKEA only had 4 in-stock and we needed 6, so we had to switch styles to get it done in time. 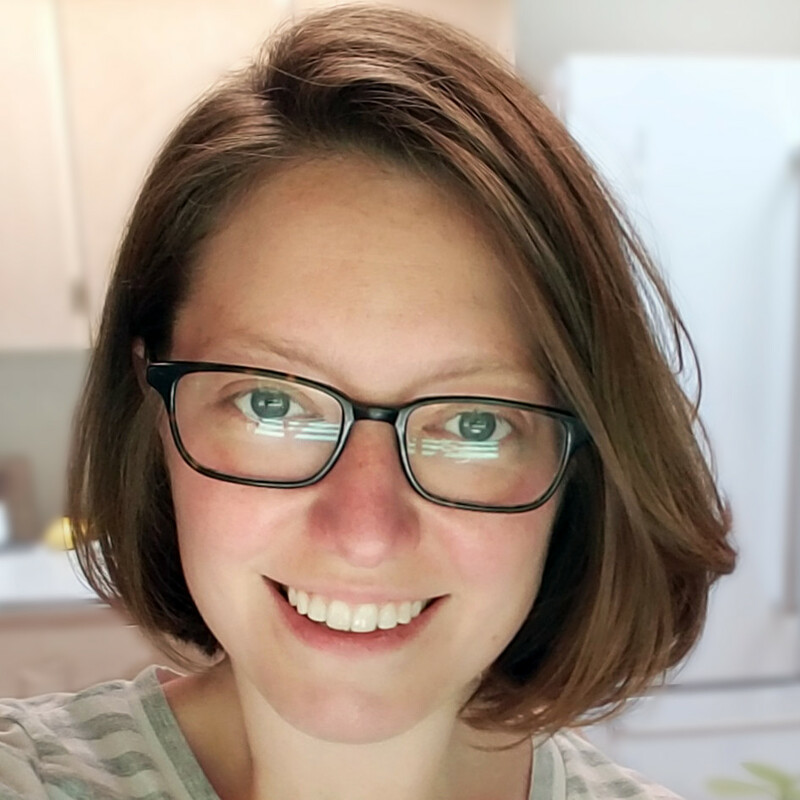 I’m SO thankful to Erin for hosting this challenge! 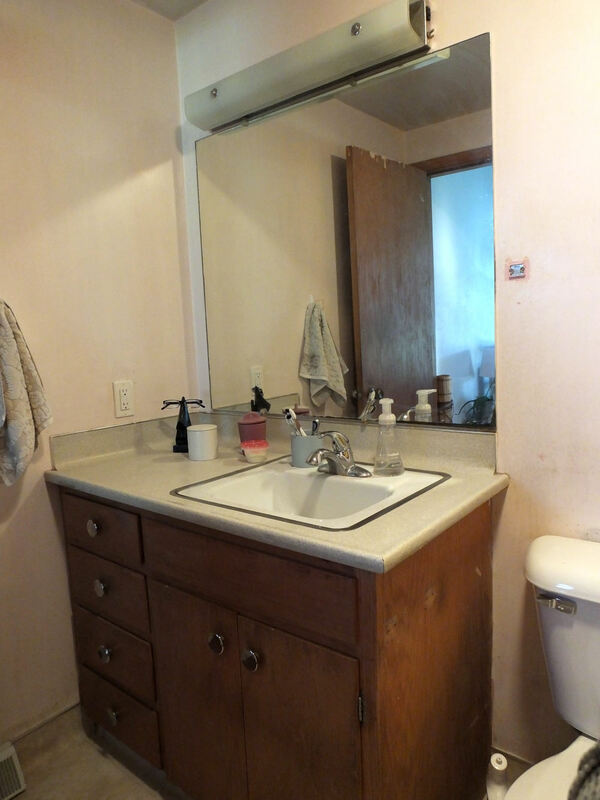 There’s no telling when we would’ve gotten the powder room done without it, and we definitely would have ended up spending more without the goal of staying within $100! Here is how the other ladies finished, go check out everyone’s great work! 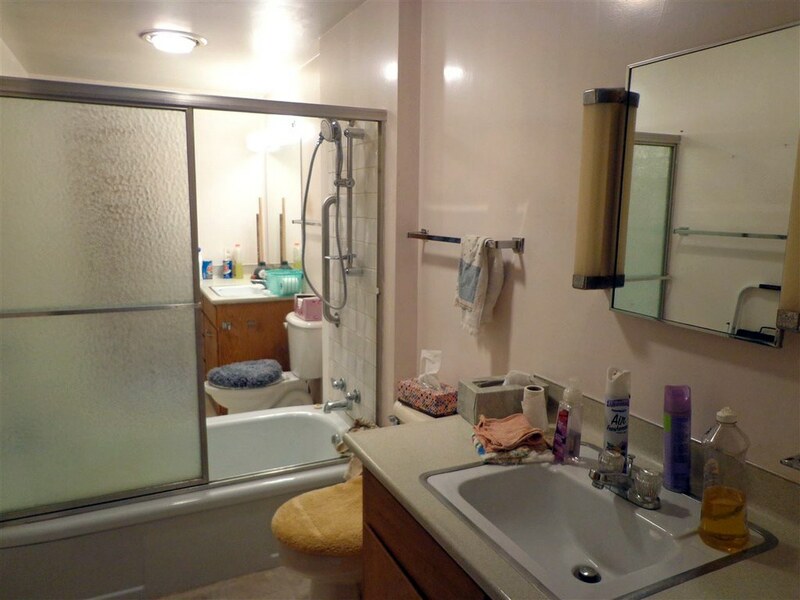 You bathroom looks great, sorry about the hanging kit, we have all been there. The mirror actual looks pretty good leaning 🙂 The wall color is beautiful and the counter top turned out great too. 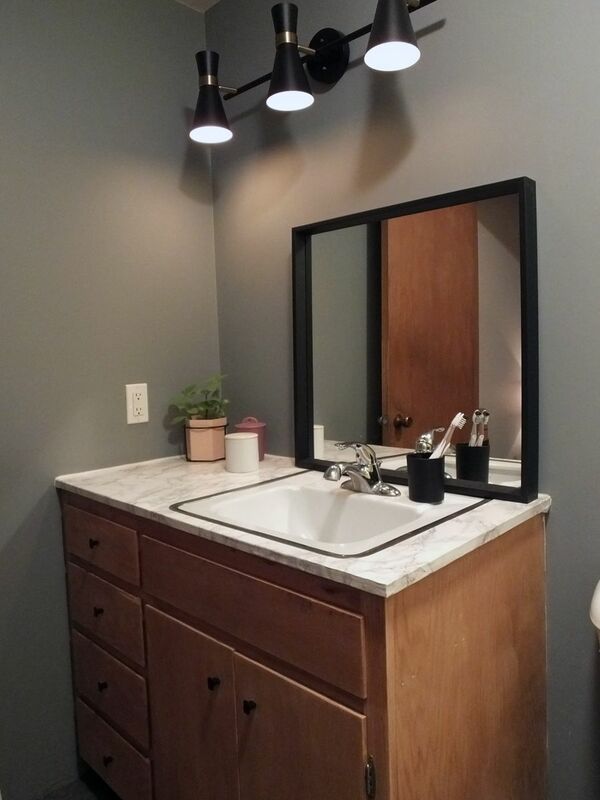 Love the mid century Modern feeling you have going on with the light fixture too. Thank you Jen! That light fixture at that price was such a surprise. It’s looking fabulous! I love the wall color and the floor tiles, and especially your mirror. And those lights are so cool! The changes you have made definitely made a huge impact, great job! It looks great! And you found some fantastic deals- I love that light fixture! What a great update for your counters too! Great transformation! Thanks Beth! The deals were what made it possible. Your space looks so, so, so much better. I love the wall color; and the updated light fixture makes a world of difference. You got a ton done in here (even if you weren’t quite able to cross everything off the list). Thank you SO much for joining the challenge this month! Enjoy your new powder room! We will be joining you again in January! Thank you Natalie. Your bedroom was a HUGE difference too! I’m in love with it all!! 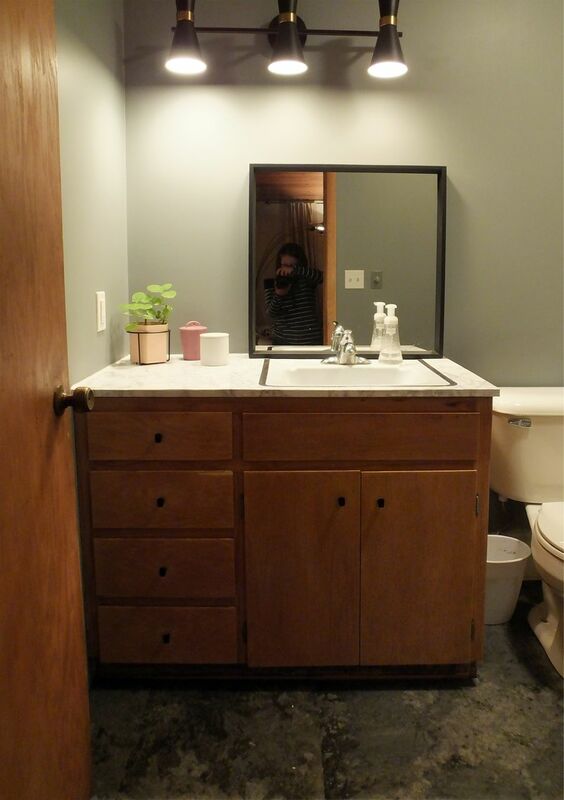 Great mirror choice! Huge impact with the changes you made – that new color on the walls and the new light fixture look amazing! and love that you replaced the mirror too. Great job!